For 54 years, PS&S has succeeded by staying true to the core values instilled by the company’s founders: dedication to our clients, excellence in our work and commitment to our employees. As we look forward, there is excitement within our company that the values established in 1962 are not only thriving, but will continue to guide us for the next 54 years and beyond. We have focused before in these newsletters on our many successful and high-profile projects, showing the depth and strength of PS&S’s single source offering for planning, design and regulatory compliance services. Our core values of client dedication and work excellence have often been focal points. This month we are focusing on our third core value: our commitment to our employees. PS&S has more than 275 professionals in seven locations offering multi-disciplined, full-service architecture, engineering, design and environmental consulting services, and our commitment to offering our people the best workplace has never been stronger. This year, we are creating new programs for current employees and systems designed to recruit the best for our future growth. The program we are highlighting in this newsletter is our Young Professionals Group, headed by Senior Vice President of Human Resources Jamie McDonald. The group is barely a few months old, but has already created a buzz throughout the company with its energy and commitment to fostering comradery and communication across the disciplines and age groups. We recognize our commitment to our people is a huge part of being successful. We are also dedicated to hiring people who understand what commitment is. PS&S has come through the recent financially challenging period stronger than ever, and there is a recommitment to creating an environment where employees want to be and can be at the top of their game. In short, PS&S is planning for both the company’s future and the future of our employees. PS&S has more than 275 employees working in many different disciplines on dozens of projects in seven offices. Senior Vice President of Human Resources Jamie McDonald knew that as the company grew and hired more people, it would be a challenge connecting all the PS&S professionals, especially the new employees with the PS&S veterans. Then he had an idea. Brian Liebeskind and Kyle Berninger are the co-chairs of the group and have much in common. 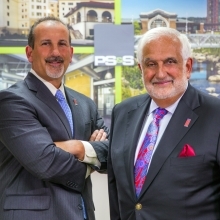 Both men grew up in New Jersey, both have been with PS&S since 2013 and both have an intense desire to make PS&S the best workplace it can be. So far, the group has several ideas in the works including creating PS&S sports teams and sponsoring events like the Jersey City 5K run just completed in April. A happy hour meet & greet to kick off the group is also planned for the summer. One accomplishment Brian would like to see the group achieve is to improve relationships with area colleges and universities. Just a few months old, the Group is already on its way to fulfilling Jamie McDonald’s goal. For more information, contact Jamie McDonald at jmcdonald@psands.com.